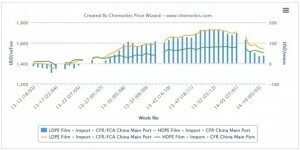 During the second half of 2013, import LDPE prices in China jumped to their highest levels since 2008 as tight supplies across Asia and strong buying appetite from China drove prices steadily upwards as per the pricing service of ChemOrbis. In recent weeks, however, the premium for LDPE prices over LLDPE and HDPE has begun to decline as the Chinese market has been struggling with ample supply levels and slower than expected demand following the conclusion of the Chinese New Year holidays at the start of February. In addition to slower than expected demand, LDPE prices have also been dragged lower by the fact LDPE supplies have loosened as some plants have returned to the market following shutdowns in the second half of 2013. 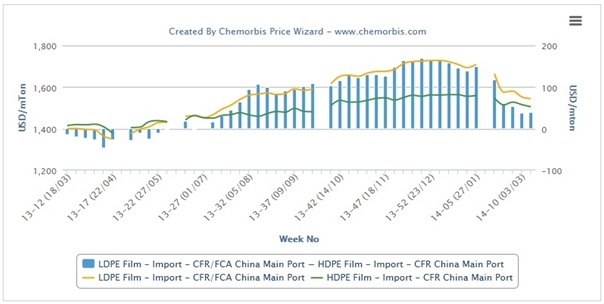 According to data from ChemOrbis Price Index, import LDPE prices on a CFR/FCA China basis began to trade at a premium over HDPE prices on a CFR China basis around the middle of June 2013, with the premium for LDPE over HDPE rising to a height of around $170/ton in mid-December. While LDPE still carried a significant premium of around $150/ton over HDPE in the last full week of January, right before the start of the holidays, the premium has declined steadily over the last few weeks and currently stands at around $40/ton. According to ChemOrbis, comparing LDPE with LLDPE, LDPE prices also began to gain a premium over LLDPE in mid-June, with the premium for LDPE reaching its highest level of $145/ton in the middle of December. LDPE still held a premium of around $120/ton over LLDPE just before the holidays, but the premium has declined significantly over the past few weeks to touch a low of around $20/ton last week. A Middle Eastern producer offering LDPE and LLDPE to China said that they reduced their prices by $30/ton for LDPE and by $10/ton for LLDPE. “Our prices are still meeting with resistance from buyers, especially for LDPE film. We believe that we will have to give some additional discounts before concluding deals,” a producer source reported.